The Tray Trolleys (12 Trays) have been manufactured for a subsidiary of a leading aerospace company who manufacture ceramic moulds. The trolleys have been fabricated from 25mm x 25mm box section and 25mm x 25mm angle to carry the trays. The box section has a thin wall to provide an optimum strength vs weight solution. Fitted to the trolleys, there is a steel document pocket to suit A4 paper 24mm deep to carry route sheets, the pocket will be flush with the 25mm box section frame to limit any potential damage when the trolley is being moved. The trolleys have been fitted with 125mm diameter steel centred wheels with a rubber tyre to reduce any vibration caused by uneven floors, 2 castors will be fixed and 2 will be swivel. 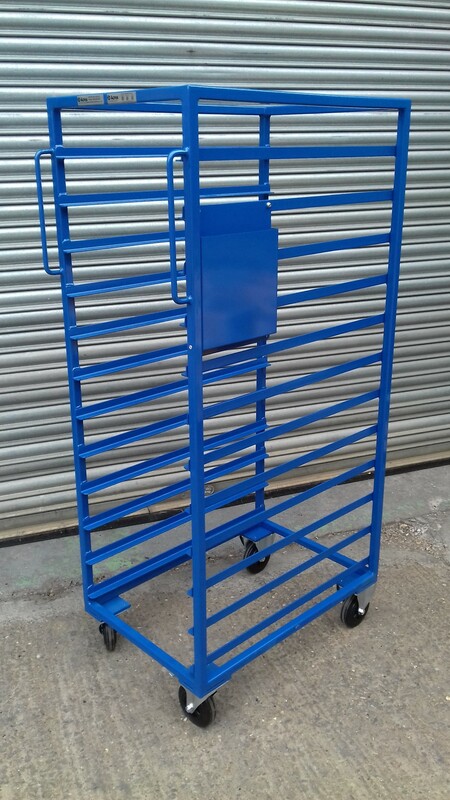 The trolley has been powder coated in Blue BS 4800 20 D 45 to provide a hard wearing, long lasting finish.